It feels as if you have stumbled onto a local secret. A hilly dirt road dissects luscious green farmland where flocks of sheep roam gullies lined with large gum trees. Steep paddocks stretch down to the coast, with a birds-eye view of Middleton, Goolwa and the Murray mouth. On a clear night the twinkling lights of Clayton Bay can be seen on the horizon. The dirt road leads onto Nikki and Glenn Harrington’s gravel driveway, winding past a home-made stable, shed and gigantic rainwater tanks. The weatherboard-clad home is revealed, blending into its rural setting with an exterior inspired by the iconic surf shacks of Middleton. Nikki and Glenn spent years looking for the perfect block to build a home and raise their two daughters. They searched from the South East, where Glenn grew up, to the Adelaide Hills and beyond, before embarking on a sea change. “A big reason to move out of the city was to avoid the rat race. Just to get down to the coast and away from it all,” Nikki says. They had been planning their ideal home for years. “Ever since Glenn and I met we thought about building a house and have been designing it ever since. We knew what we wanted by the time we got here,” Nikki says. They gave their blueprint to local builder South Coast Constructions, who loved the concept and made some expert adjustments. The oversized timber front door is a clue that there is more to this home than its beach shack exterior gives away. Stepping inside, a rammed earth wall runs along a generously wide hallway that creates a grand sense of openness. Nikki and Glenn selected timber pendant lights for this space to tie in with the Tasmanian oak hardwood floors. To the left a sliding barn door opens to the children’s wing of the house, but the attention is drawn straight ahead to a gorgeous kitchen, dining area and lounge that presents a sublime view of the countryside and ocean. “There are so many things we like about the house,” Glenn says. “But its best asset has to be the view.” There is much to admire in the kitchen and dining space, from the raked ceiling and bulkhead above the kitchen, carefully-chosen lighting features, resort-style ceiling fans and clever tilt and turn windows that allow summer ventilation. A bright sapphire blue splashback is repeated as a feature above the kitchen window, designed to blend seamlessly with the ocean beyond. A Tasmanian oak built-in desk has data points for charging phones and is ideal for looking up a recipe, or just sitting to admire the view or check on the chickens outside. “We wanted a space for friends and family to be able to use their devices whilst we are preparing meals and entertaining in the kitchen,” Glenn says. The couple opted for an extra-wide Essastone kitchen bench with a sandy texture, allowing family or guests to sit opposite the chef and admire views through the window. 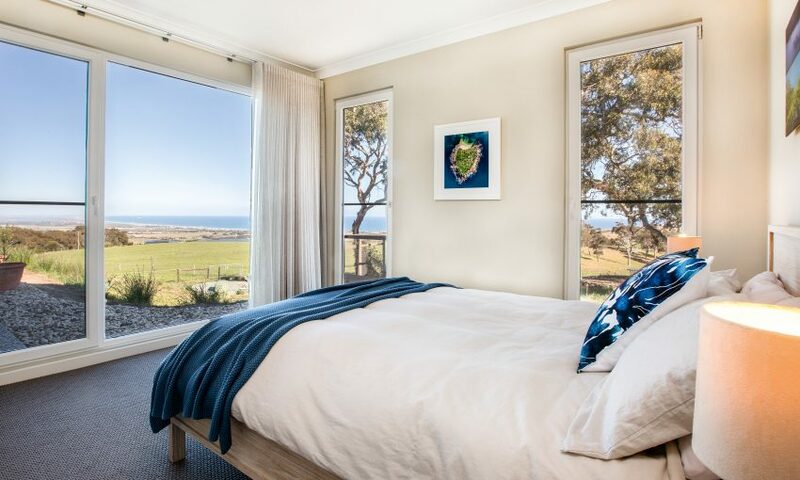 When sitting, the window is at the perfect height for views of the coast. “We wanted a wide kitchen bench, because everyone likes to congregate here when you’re cooking, especially the kids, so it gives them somewhere to sit. You can watch the sheep migration down the hill every morning and the kangaroos,” he says. Then there’s the fireplace. Surrounded by another rammed earth feature wall, the large fire box keeps the house warm for hours after the flames have died. “It can be absolutely howling a gale outside, but you can walk in and thaw out with the fire going. I love hanging out in this space while admiring the rural and ocean views, including whale watching. You can be here in any weather and feel comfortable.” The parents can also keep an eye on Zara riding her pony over Glenn’s home-made jumps course, which is in full view of the living area. Nikki and Glenn share an appreciation of good thermal design, having lived on the Canadian prairies where temperatures would drop to minus 50 degrees. Highlight windows allow winter sun to shine on the rammed earth. “Even in winter all you need is to get a little bit of sun during the day and it warms everything up. I also love the natural light in here,” Nikki says. In summer, the reliable sea breeze is welcomed into the home and vented through north-facing highlight windows, while large fans move air through the home. Double-glazing was high on their priority list. Both inside and out, the design achieves a balance of ocean and rural influences, with timber, corrugated iron and rammed earth marrying perfectly with the weatherboard cladding, colours and textures of the beach. A painting by South Australian artist Victoria Rolinski reminds Nikki of dunes at Kingston SE where the family previously owned a holiday property. “A bit of the inspiration comes from that beach resort feel; ceiling fans and soft textures,” she says. Exposure to the elements, especially the winter southerlies that roar up the gully, is factored into the blueprint. In the exposed areas of the property the vegetation has a windswept drunken lean, so creating a comfortable outdoor area was a challenge. To address this, the home was designed in an ‘L’ shape around a courtyard, grass area and small herb garden for protection from the howling winds. “Because we’re up on top of a hill, the wind is just relentless some days,” Glenn says. “Some days it’s beautiful. But in the middle of winter you get the westerlies and the really cold southerlies.” It works so well that the courtyard is peaceful even in the windiest conditions. The master bedroom and en suite branch off the home to create a parents’ wing that capitalises on the view. “Often I’ve been sitting at the desk in the study and seen whales off the point at Middleton, although you can’t quite pick the barnacles off them,” Glenn says. A laundry is accessed directly from the carport for unloading muddy boots and clothes after a session of horse riding, a day in the garden or time spent at the beach. Moving back to the girls’ side of the house, the second lounge room can be closed off by sliding across the barn door. A three-way bathroom is teenage-proof with two basins, while the girls’ bedrooms enjoy views of the coast. This article was first published in the Dec 2018/Jan 2019 issue of SALIFE.